Lot 268. Achaemenid Kingdom. 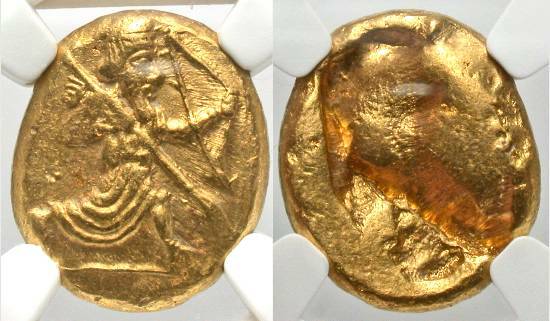 Xerxes II to Artaxerxes II. Ca. 420-375 B.C. AV daric (15 mm, 8.35 g, 11 h). Persian king or hero in kneeling-running stance right, holding spear and bow / Rectangular incuse punch. Carradice type IIIb/C. NGC Ch AU, strike: 4/5, surface: 4/5.